Judy G. (Willey) White, 71, a long-time resident of Winchester passed away peacefully, surrounded by people who loved her, on the afternoon of Wednesday, January 30th. after a long and brutal fight against cancer, she chose a glorious winter day, covered in fresh snowfall and sunshine, on which to leave. Judy was born in Keene, New Hampshire on November 2, 1947 to Ruby (Brown) and Morris Willey. She attended schools in Keene, Newport, Vermont, and Marlborough. Though her formal education was limited, Judy undoubtedly held a Ph.D. in kindness and generosity. She truly spent her life caring for others. Judy married the love of her life, Larry White, on June 17, 1967 in Westmoreland, New Hampshire. They built a strong life together, supporting one another through Larry’s service in the United States Marine Corps in Vietnam. Judy wrote to him every day while she waited for his return. They spent the rest of their lives together raising two daughters, caring for Judy’s mother after a stroke, and turning the tiny hunting camp they bought into a home. This home welcomed family and friends, sheltered relatives in times of trouble, and was always filled with a spirit of love. They were together until his death January 26, 2014. Judy missed Larry every moment since, and it brings her family comfort knowing they’ve been reunited. Judy is survived by her daughters, Stephanie White Ferland of Wilder, Vermont, and Sharon White of Swanzey, New Hampshire, her son-in-law, Scott Ferland of Portage Lake, Maine, her grandchildren, Colby Ebbighausen of Winchester, Hannah Dettelback of Swanzey, Jaclyn Ferland of Florida, and Ryan Ferland of Raleigh, North Carolina. 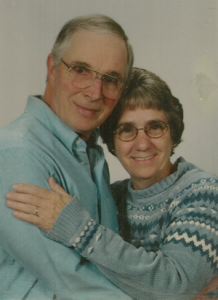 She’s also survived by her former son-in-law, Ryan Ebbighausen of Winchester, because once you’re part of Judy’s family, you’re always part of Judy’s family. In addition, she’s survived by her siblings, Richard Willey of Hernando, Florida, Mary Blanchard of Roxbury, Barbara Fish of Chesterfield, Morris Willey, Jr. of Winchester, her brothers-in law, Doug Fish of Keene and Leonard Blanchard of Roxbury. As important to her as family, she’s also survived by her dearest friends, Althea Nelson of Winchester, Linda Dunham of Fitzwilliam, and Irene Rokes of Winchester. It is with the deepest gratitude that Judy’s family thanks the friends and family who came together to care for her at the end so that she could die in the comfort of her home. We couldn’t have done it without a single one of you.